Many residents of this quiet, close-knit farming community could hear the rapid crackling of gunfire from a rampage that left 10 people and the shooter dead. Others got frantic phone calls from friends or relatives. But none of them knew yet that the heavily armed gunman was someone who grew up among them, playing youth baseball, graduating from the local high school and working by their sides at local factories. Those who knew 28-year-old Michael McLendon and even those who just remembered his name or face couldn't believe the bloodshed in two counties near the Florida border Tuesday that left him, five of his relatives and five bystanders dead. Jessica Wise went to school with McLendon from kindergarten through graduation from Samson High School in 1999, a class that had about 50 students. She said he was quiet, nice and polite, didn't join other boys in pulling pranks and always had his shirt tucked in. "You never saw him out at parties. He never got in trouble," Wise said. Wise said McLendon played football and baseball in elementary and middle school, was a member of Future Farmers of America and talented in welding and woodworking. Wise said they fell out of touch after high school. McLendon began his killing spree a dozen miles from Samson in Kinston in Coffee County, where he burned down the home he shared with his mother, killing her. It ended about an hour later with him taking his own life after a shootout with police in nearby Geneva at Reliable Metals, where he worked until 2003. In between, he gunned down four relatives and the wife and 18-month-old daughter of a local sheriff's deputy on a wide front porch that looks like so many others in Samson. He then turned his gun next door and killed his 74-year-old grandmother and sent panicked bystanders fleeing and ducking behind cars. McLendon then drove off, spraying bullets through the town lined with old brick buildings, killing three more bystanders. The shootings cast a pall over an old town of 2,000 people that rarely changes. A black bow blew in the breeze in front of City Hall the day after. Across the street, workers replaced a window at Bradley True Value Hardware, which was hit in the hail of gunfire. "God bless the victims and their families and God bless Samson," said a scrolling electric sign at Byrd's Nest Florist on Main Street. Darrell "Smitty" Smith, a corporal with the Sansom Police Department, served in Iraq with the Alabama National Guard. He was shocked by the carnage at the home of McLendon's relatives. "Walking up on that porch and seeing that, it was much worse than anything I ever saw in Iraq because at least in Iraq you expect it, you are prepared for it and you stand a chance to protect yourself," Smith said. "We are just a small town and we were not prepared for anything like this," he said. Authorities say McLendon had struggled to keep a job and left behind lists of employers and co-workers he believed had wronged him. The lists found in McLendon's home included Reliable Metals, which forced him to resign years ago, a sausage factory from which he suddenly quit last week and a poultry plant that suspended his mother, District Attorney Gary McAliley said. Federal court records show McLendon and his mother are among Pilgrim Pride employees who filed a lawsuit in 2006 against the Pittsburg, Texas-based poultry firm over claims of unfair compensation. A company spokesman did not immediately respond to an e-mail seeking comment. The pages torn from a spiral notebook included names of co-workers, including one who reported him for not wearing ear plugs, another who made him clean a meat grinder and a supervisor who didn't like the way he cut pork chops, McAliley said. Investigators offered no immediate explanation for why McLendon targeted relatives and others who weren't on the list as he fired more than 200 rounds in the worst mass killing by a single gunman in Alabama history. McAliley said McLendon's parents had divorced, although he didn't say when. McLendon apparently sided with his mother in the split and he developed bitter feelings against some members of his family, with his desire to possess a family Bible an issue, McAliley said. As word about the killings spread, Samson high graduates scrambled to find their yearbooks, and many realized they knew the gunman. Derek Weeks, 28, was senior class president of McLendon's class. "He was kind of reserved and to himself. I can't tell you one bad thing about him," said Weeks, who lives in nearby Enterprise. "I don't remember him ever getting in any kind of trouble." Like many, Weeks couldn't believe the terror that shattered the small community. "But one benefit to living in a small town is the closeness of the people," he said. "So we know that if something happens, everyone will still be together and will be there for the families of those victims." 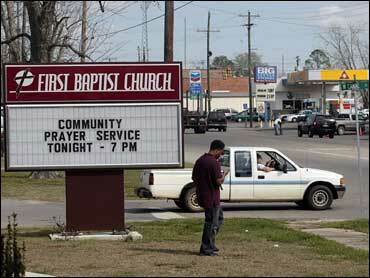 On Wednesday night, hundreds of community members gathered for a prayer service at First Baptist Church of Samson. "Father, there are times in life when we don't have answers to the question 'Why?"' Rev. Steve Sellers told the congregation. "I don't know what set a young man off like that, but I, too, want to pray for his family." The answers might never be known. Lt. Barry Tucker of Alabama Bureau of Investigations said McLendon was "somewhat depressed about job issues" but that investigators don't believe the shootings were job-related. "There's no specific indication of 'This is why I did it,"' said Tucker who wouldn't release a motive. It was not clear how long McLendon had been planning the attack, but authorities said he armed himself with four guns - two assault rifles with high-capacity magazines taped together, a shotgun and a .38-caliber pistol - and may have planned a bigger massacre than he had time to carry out. "I'm convinced he went over there to kill more people," said Sheriff Dave Sutton.